Everyone knows the heart of any workspace is your desk. Your office desk is the place where your work comes to life. Where ideas happen. Where you are at your most productive and where you are ready to take on the world. Or maybe just that looming deadline. Whether you are an executive manager who needs privacy or an employee who works as part of a collaborative team, our office desks come in an impressive range of sizes, styles, colours and finishes to suit any budget or space. When you shop with BFX, you will receive nothing but professional service. There is no job too small or too big for us to handle. What to look for in an Office Desk? 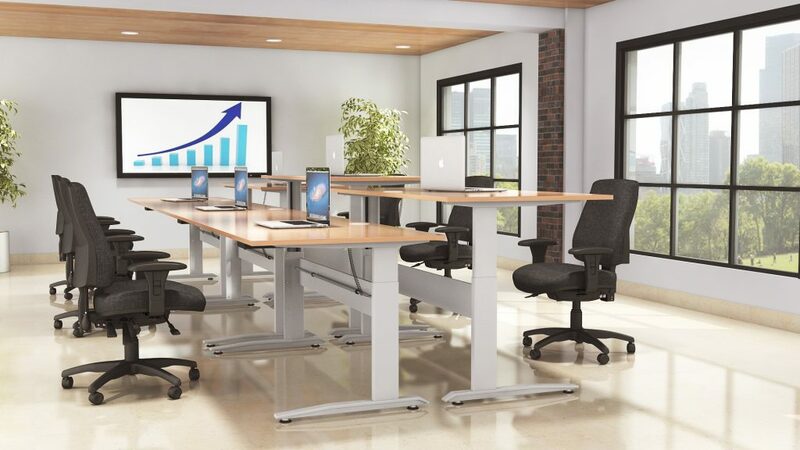 Every office desk is different, and with so many on the market, it can be challenging to find your ideal fit. Too many people fall into the trap of just buying a cheap desk only to realise it has a relatively short lifespan when compared to a high-quality desk. How to Choose the Right Office Desk for You? Set your Budget: For you to get the best value for your money you first need to set your budget then start researching and comparing different products according to your needs. Start with the Space: We recommend starting with the actual workspace itself, the room or area in which your office desk will occupy. This could be your home office or work office. Find Your Ideal Shape: Then you can accurately select your desk shape. Some spaces better suit an L shaped desk, some suit a corner office desk, straight desk or full corner workstation. We recommend measuring your room. Decide on Style: Next, decide on the style you want to achieve in your workspace. Modern? Scandi? Luxe, Industrial or maybe Executive? This will help narrow down your focus. Think About Ergonomics: If you work a desk job you need to be aware of proper workstation ergonomics. Sitting down all day is notorious for causing back pain, neck pain and shoulder pain. A sit-stand or standing desk encourages you to stay active during the day. Think About Extra Features: The most streamlined workstations have easy cable management, built-in pen/file drawers, desk returns, overhead hutches for more storage or even height adjustable legs. The last thing you need to determine is if you are the only person who needs a workspace? Maybe you work in a 2 person team environment perhaps you need a dynamic 4 person workstation for better collaboration and communication. Finally, its time to find office desks near you! We have showrooms and local reps in Brisbane, Sydney, The Gold Coast, Sunshine Coast, Perth, Melbourne, Townsville and much more. Visit our Contact Us page to see all of our locations.